Hastings United Football Club will seek to close the gap on league leaders Cray Wanderers as it contests another away game tonight (Tuesday). Second-placed Hastings will travel to Whyteleafe seeking a victory which would put them seven points behind Bostik League South East Division leaders Cray with a game in hand. The league table has been revised following the demise of Thamesmead Town, whose record has been expunged. Hastings have lost the three points for their 5-1 win at home to Thamesmead on the opening day, while Cray’s record remains unchanged as they hadn’t played Thamesmead. Hastings are four points above Hythe Town, who are up to third, having played a game less and are nine points better off than tonight’s opponents Whyteleafe, who are eighth. Despite that, Hastings will be well aware of the threat Leafe pose having lost 4-2 at home to the Surrey club in the Buildbase FA Trophy last month. 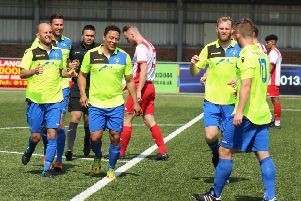 Hastings will be eager to build on their terrific second half performance on Saturday when they recovered from 2-2 down to draw 2-2 away to Faversham Town - their first league draw of the season. Whyteleafe also picked up a point at the weekend, in their case from a 0-0 draw away to VCD Athletic. Hastings will be missing dependable captain Sam Adams, who will serve a one-match ban following his sending-off against Merstham in the Velocity Trophy last Tuesday. Kick-off is 7.45pm.